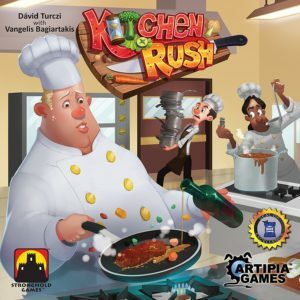 This Kitchen Rush review was made after playing the game six times. 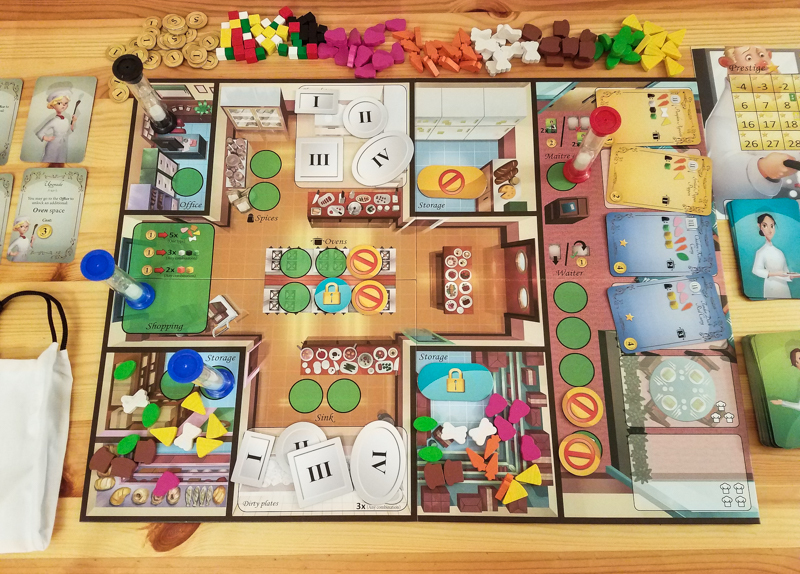 Kitchen Rush is a real-time worker placement game in which you are attempting to fulfill as many food orders as you can in four 4-minute rounds. The game was designed by Vangelis Bagiartakis and Dávid Turczi, and it is published by Artipia Games and Stronghold Games. 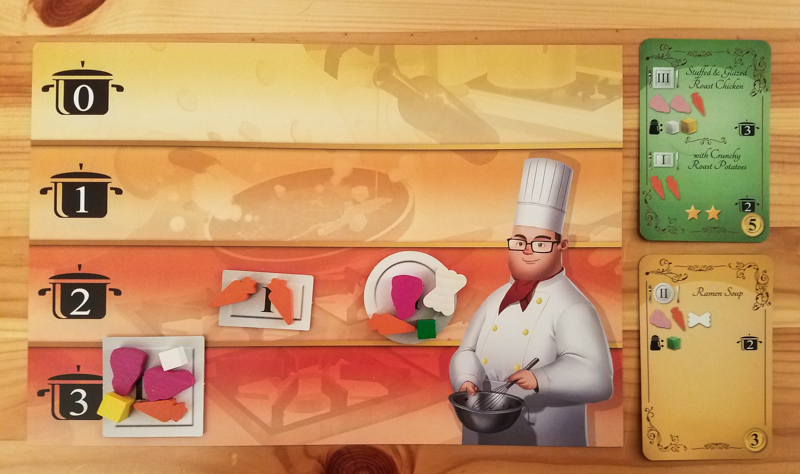 During each game of Kitchen Rush, you’re going to be trying to meet the requirements of an objective card. 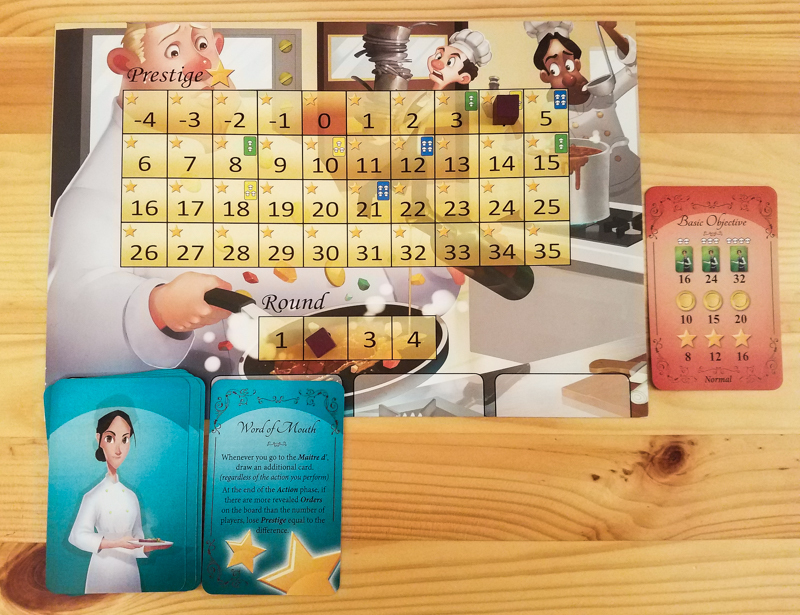 Each objective card has a difficulty level and could include an amount of orders you need to fulfill, an amount of prestige you need to gain, the amount of money the restaurant needs to make, or maybe even some special rules that you need to follow. During each round of the game, you’ll use your two workers (sand timers) to move around the restaurant and attempt to fulfill the orders in front of you. You do this by placing the sand timers at different locations in the restaurent and taking those actions. Once you’ve started an action with your worker, you’ll need to wait for the sand to run out before you can take another action with that worker (about 30 seconds). The first thing you’ll usually be doing is grabbing an order or two so you can get to work on them. After you get your orders and put the required plates on your player mat, you’ll get the ingredients you need from the storage area. Once you’re ready to cook, you’ll go to the ovens and move one of your plates down the player mat per worker, which represents a certain amount of time passing as that food cooks. You’ll also usually need to go get spices, which is when you go to the spice bag to find the ones you need for your meals and put them on your plates. Often you’ll find that the ingredients and spices you need aren’t available in the restaurant. When this happens you need to go shopping. If there is money in the office, you can buy ingredients and spices from the store and add them to the storage spaces. Those are the main actions in the game, but you’ll also be taking more orders, cleaning dirty dishes, and going to the office. The office actions are pretty great because they allow you to upgrade the kitchen, fix broken equipment, or even hire new workers. At the end of each round, you’ll check to see how well the kitchen is running. First you’ll check if all of the orders in front of the players have been completed. For each order that was prepared correctly, you’ll get money and possibly a little bit of prestige. For incomplete or incorrect orders, you’ll lose prestige. After you receive money and adjust the prestige level for all of the orders, you’ll then pay each worker three coins if you can. For each worker you can’t pay, you’ll lose a prestige point and those workers will need to be hired back in future rounds. You want to keep your prestige up because there are certain spots where you get Prestige Bonus cards that make future rounds slightly easier. Once you’re used to playing the game, you can add in Event cards. These cards are drawn at the beginning of each round and they make the game more challenging by giving you new rules you need to follow. If after four rounds you have completed all of the objectives, everyone is paid, and you have at least one coin and one prestige, you win! The designers did a fantastic job implementing the theme into this game. You really do feel like you’re “in the weeds” while working in a busy kitchen. This is pretty much as cooperative as cooperative board games get. You really can’t win unless you work together and the real-time element pretty much forces you to communicate with everyone on your team. You’ll need to go shopping for other people and you’ll need to let others know when you need something for your orders (or when you need new orders!). Even though the sand timers aren’t the best (see below), I do like how they’re used in this game. They both represent the workers that you control and the time it takes them to complete tasks. I really can’t think of anything that could replace them. 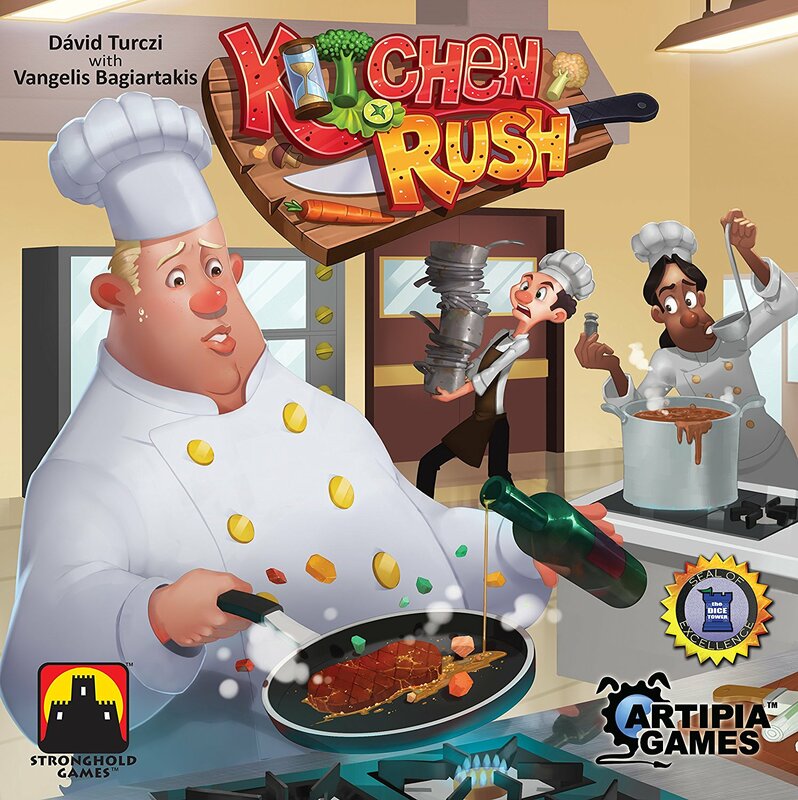 Kitchen Rush has very high replayability. It’s extremely tough to beat even at the lower difficulty levels, which will make you want to get better. You can also add in the event cards, which completely change up how you approach each round. This is not a very attractive game. The wooden ingredients are nice and the character art is pretty good, but just about everything else looks like it’s from a prototype rather than a finished product. This might just be my opinion, but I’m not sure a bag of mixed spices makes sense in this game. Sure, it slows you down, but why aren’t the spices separated? The game would still be difficult even if the spices were kept in the storage areas with the other ingredients. I just don’t think the bag was necessary. My group has had some issues with these sand timers. The sand gets stuck in some of them and some take five or more seconds longer than others to run out. Despite the issues I pointed out above, my group puts Kitchen Rush right up there near the top of our real-time rankings. It’s thematic, it’s chaotic, and it’s tough, which is a great combo for these types of games. A bunch of people in my group have worked in restaurants in the past and we all feel like this is about as close to the real thing as you can get in a board game. You really do feel like you’re in the weeds, but it’s more fun than stressful (though it is pretty stressful). 5-Minute Dungeon is still our favorite cooperative real-time game, but Kitchen Rush isn’t too far behind. If you like real-time games, you should definitely check this one out. You’ll also probably love it if you like the restaurant theme. However, if you haven’t liked real-time games in the past, this one probably won’t change your mind about them. It’s the type of game that seems to meet expectations, so you can go with your gut on this one. Thanks for taking the time to read our Kitchen Rush review! To stay updated on all things cooperative board games, follow us on Twitter, Facebook, or via RSS.